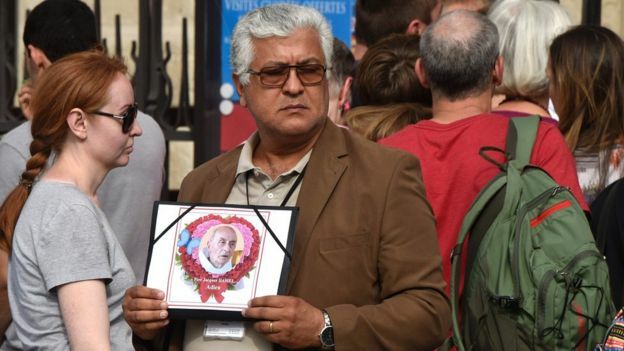 French religious leaders have called for more security at places of worship following the murder of an elderly priest in Normandy on Tuesday. Representatives of Christian, Muslim, Jewish and Buddhist faiths spoke after meeting President Hollande. On Wednesday evening Mr Hollande went on to attend a mass for the priest in Paris’s Notre Dame Cathedral. 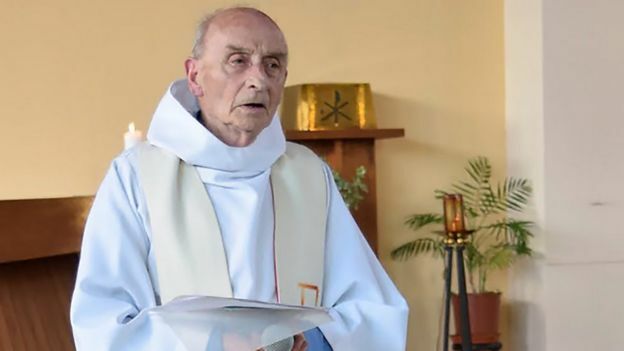 Fr Jacques Hamel died while conducting a service in his church in Saint-Etienne-du-Rouvray, a suburb of Rouen. 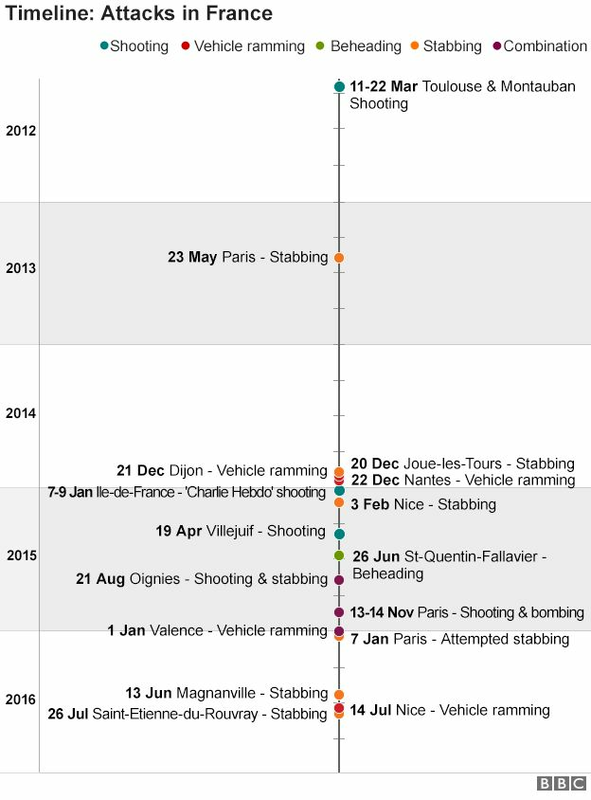 The killing came 12 days after the attack in Nice in which 84 people died. Only one of the two attackers has been named. 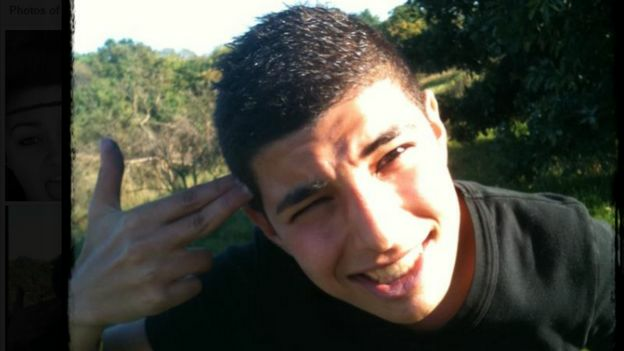 Adel Kermiche, 19, had twice tried to reach Syria to fight with the self-styled Islamic State group (IS). 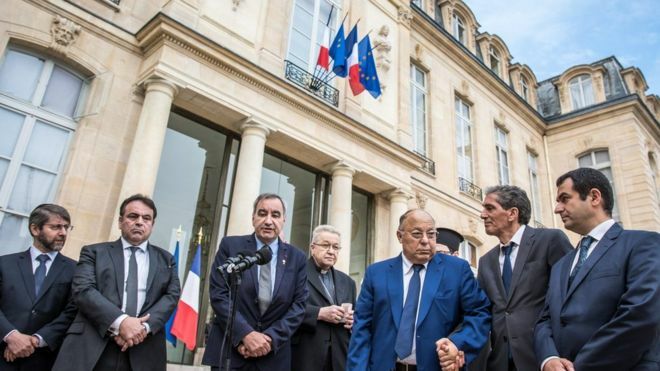 Muslim leader Dalil Boubakeur, rector of Paris’s Grand Mosque, said the leaders “deeply desire that our places of worship are the subject of greater [security] focus, a sustained focus”, as even “the most humble place of worship” can be subject to an attack. Mr Boubakeur expressed “profound sorrow” on behalf of French Muslims at the attack, which he described as a “blasphemous sacrilege”. The Archbishop of Paris, Andre Vingt-Trois, praised the harmonious relations between France’s religions. “We must not let ourselves get pulled in to Daesh’s political games,” he said, using a pejorative term for IS, saying it wanted “to set children of the same family against each other”. President Francois Hollande has also been chairing meetings of his security and defence council and his cabinet. On Tuesday Mr Hollande appealed for “unity” as he warned that the war against terrorism “will be long”. “Our democracy is the target, and it will be our shield. Let us stand together. We will win this war,” he said. According to Le Monde (in French), the prosecutor’s office had asked for Kermiche to remain in detention but this was overruled by a judge. She ordered that he be released to house arrest with an electronic tag ensuring that he remained at home, except on weekday mornings. This meant that on Tuesday morning he was free to leave the family home and head to the church. He and his fellow attacker slit Father Hamel’s throat before being killed by police. One of four people taken hostage suffered severe knife wounds, prosecutor Francois Molins said. What drives individuals to commit mass killings? In an editorial, Le Monde says it will no longer feature photographs of those behind attacks such as the one in Saint-Etienne-du-Rouvray. It was doing so “to avoid giving posthumous credit” to those responsible, while adding that the intention of killing Father Hamel was to provoke “the blind vengeance that would place the entire country under the empire of hatred”. The move was repeated by the broadcaster BFM. Elsewhere, Le Figaro’s editorial accuses IS of continuing “to pursue its sinister plan: to turn the world into a bloody theatre of war” and calls on the French government to resort to “all military, police and judicial means to ensure the safety of our citizens – whether they believe in heaven or not”. France is still reeling from the Bastille Day attack in Nice earlier this month, when a lorry was driven into celebrating crowds by Tunisian Mohamed Lahouaiej-Bouhlel, killing more than 80 people. That was followed by four violent incidents in a week in neighbouring Germany, two of which are linked to IS. IS used its news agency to claim the attack in Normandy – thought to be its first on a church in the West. Christians in Iraq and Syria have long been targeted by the group, with reports of forced conversions and killings. The president of Normandy’s regional council, Herve Morin, called for France to learn lessons from the countries hardest hit by terrorism. “We need to Israelise our security,” the former French defence minister told Le Figaro. Gangajal sold out like hot cakes in Kolkata!